School buses aren’t designed for comfort because most trips to school and home again are brief. 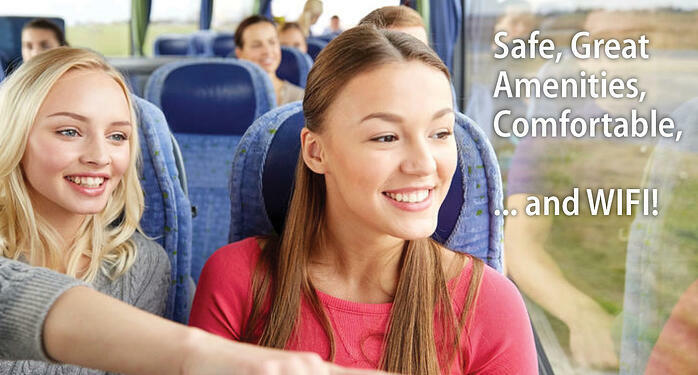 But when your group is traveling for hours to reach an event or other venue, comfort can add a lot to the overall well-being of everyone onboard. Indian Trail’s state-of-the-art buses place comfort second only to safety and offer personal climate and lighting controls; roomy, well-padded, adjustable seats with head, foot and arm rests; cup holders; and three-point safety belts (on many coaches). Riders travel in comfort, awake or asleep, and arrive refreshed and ready to go! Trying to coordinate parents to drive on long-distance trips is the stuff of nightmares. When you charter a motorcoach, however, everyone remains together, no one gets lost, takes a wrong exit, or misses a turn, and those always-essential head counts are a cinch. Moreover, our coaches are equipped with two types of GPS so we always know where we are and where we’re going. Indian Trails buses are designed for the long haul and have onboard bathrooms so there’s no need to factor in unscheduled rest stops and risk accidentally leaving someone behind. And you save time overall coming and going! Many school-related trips involve sports teams, bands and other groups with extra baggage like equipment and musical instruments. Indian Trail’s coaches have ample below-deck storage space as well as overhead storage for smaller luggage like backpacks. You can rest assured your students and their essential gear will arrive together ready to learn, perform or play. It’s hard to imagine attempting a long trip with a bus load of kids (of any age) and no Internet capabilities. We get it so we got it — onboard WiFi, DVD players with color monitors, and free device charging (110 volt or USB). Riders can entertain themselves with their own devices or enjoy a DVD! Indian Trails can also provide transportation for smaller groups in our new 34-passenger motorcoaches that have all the amenities and safety of our deluxe full-size coaches but at a lower cost. And, unlike travel by air, Indian Trail’s 56-passenger motorcoaches are perfect for longer-distance trips when riders will want to relax, recline and get some shut-eye. No matter the size of your group, the amount of luggage or the distance you must travel, Indian Trails is the best choice for all your school trip needs. If you’re new to travel with youngsters, you will want to read our free “Professionals Guide to Bus Trips with Kids,” and then request a quote for your next trip!